"He is almost always found side-by-side with Bella. They are the only two in their bush enclosure and will live out their days together." 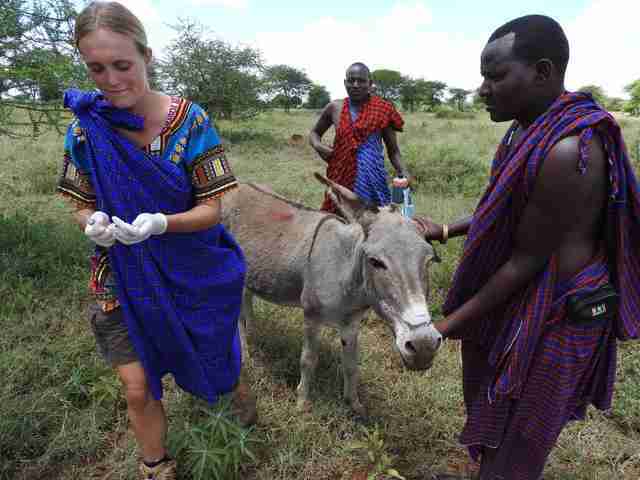 Chloe Breakwell is a 26-year-old, newly minted veterinarian who has devoted her life to saving animals - in the middle of a desert. Among her favorite patients is a lion couple who fell in love after being rescued - Simba and Bella. 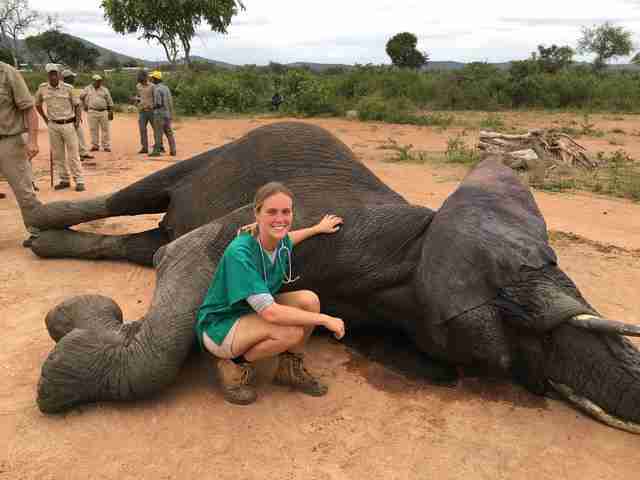 After graduating from vet school in Melbourne, Australia, Breakwell began donating her expertise to save wild animals in Africa and around the globe. "I have been working and volunteering my time independently this year, trying to get as much experience with wildlife as possible - particularly in Africa," Breakwell told The Dodo. Being in the trenches with injured and ill animals also means getting pretty attached to them. Last April, Breakwell spent a lot of time with a lion named Simba, and the two formed a special bond. 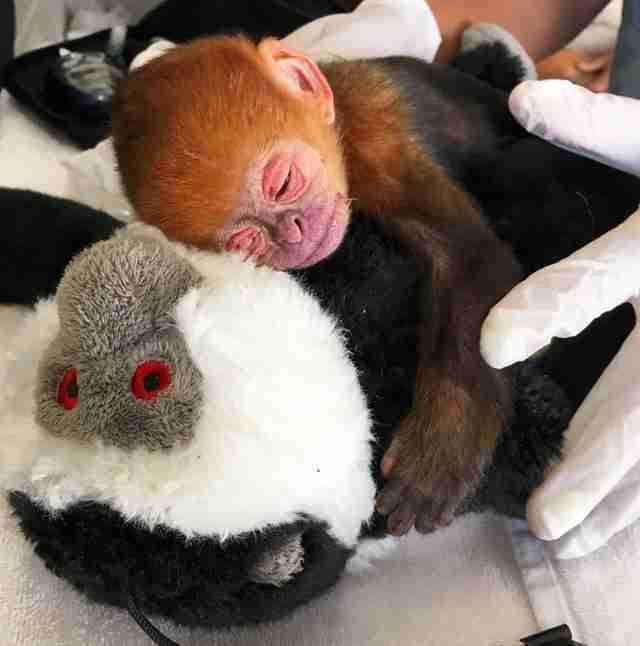 "I met Simba when I was working with the veterinary team at the Lilongwe Wildlife Centre in Malawi," she said. "I instantly fell in love with him, and even more so after I heard about his history of how he came to live there." Simba, born in a French zoo in 2005, was rescued from an animal trainer in 2012 - he'd been living in a small trailer, and was only given access to fresh air and exercise, albeit in a cage, while the trailer was being cleaned, according to the Lilongwe Wildlife Centre. 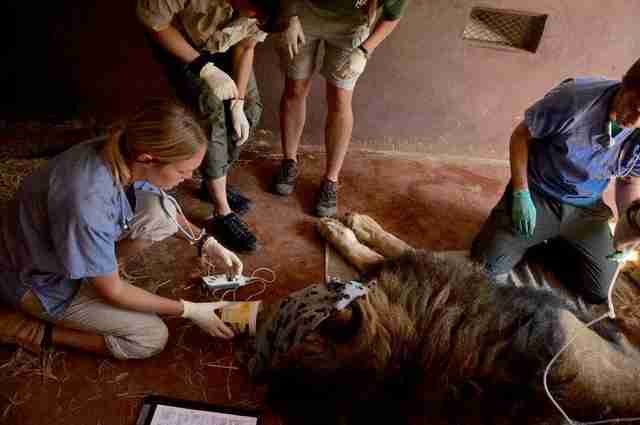 Eventually, officials in France ordered Simba's release and he was brought to Lilongwe in 2014. 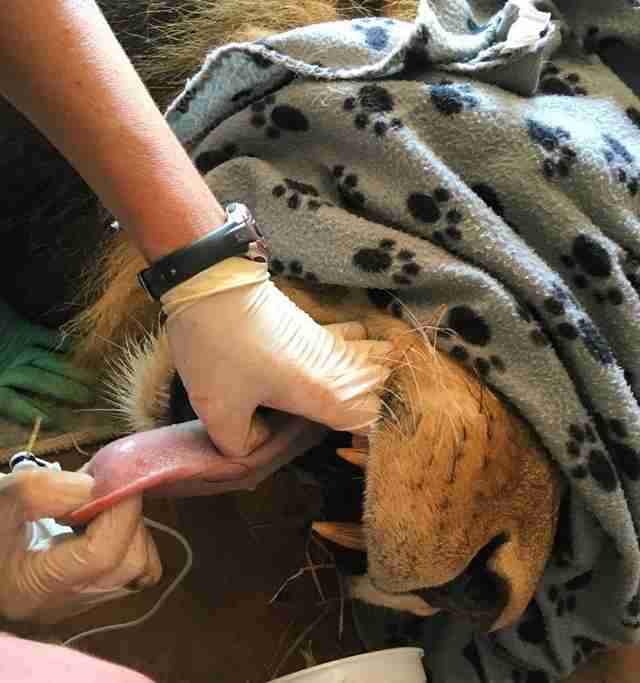 While training at Lilongwe, Breakwell treated Simba directly during a health check-up, as well as administered pain meds for a condition resulting from Simba's time in captivity as a circus animal. "He is an older lion and has the signs of a difficult past, but loves nothing more than roaming around finding the sunniest spots to lie in," Breakwell said. "There is no doubt that Simba has been a very memorable patient of mine. His gentle nature, combined with his very impressive presence and heart-wrenching past make him truly unique and special." Despite winning over Breakwell, Simba's heart belongs to another lion named Bella, who came to the sanctuary in 2009. The first lioness to enter Lilongwe, Bella also has an unhappy past - she was rescued from a Romanian zoo where she had lived completely alone for years. That all changed once she met Simba. "[Simba] and Bella are almost always found together and are the best of friends," said Breakwell. "He is very protective over her and has been known to charge the fences if volunteers on monitoring duties are getting too close to her!" And Breakwell had plenty of time to get to know the dynamics of the loving pair during her time as a vet at Lilongwe. "Simba is gentle and really just a big softie. He is a proud and regal lion, but is always kept in his place by Bella!" she said. "She is definitely in charge." "He is almost always found side-by-side with Bella. They are the only two in their bush enclosure and will live out their days together," she said. "I have to say, [Simba] and Bella are undoubtedly the stars of [Lilongwe] and everyone's favorite pair!" 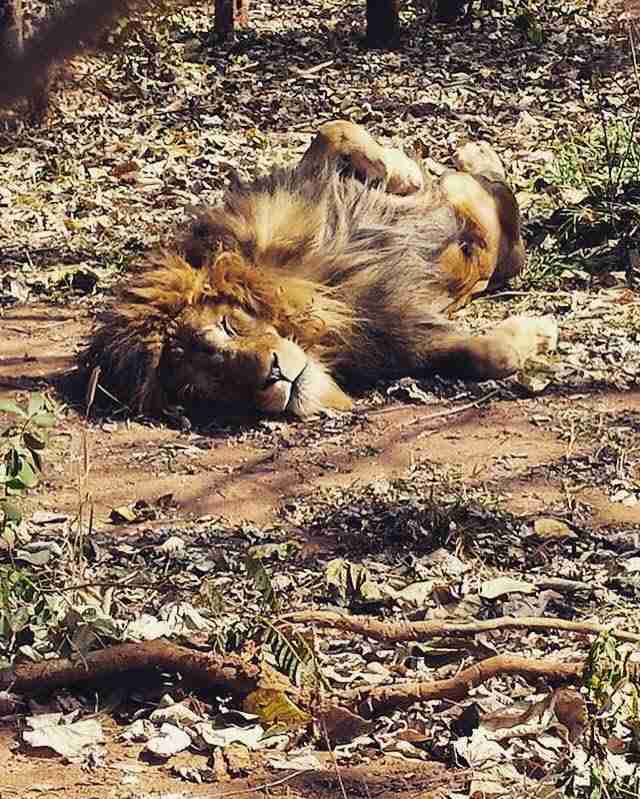 "Simba has a very relaxing life now and is free to do as he pleases in his huge bush enclosure. That is, of course, if it's OK with Bella!" Breakwell said. "It was an absolute honor to work with [Simba]," she said. "To know that he has been rescued from such a horrific life to live out his days free and back in Africa where he belongs brings me so much happiness and heightens my faith in people." Though hanging out with big cats may seem like a dream job, it's not without its challenges, and not all stories turn out so well, as any medical professional knows. During her time in Africa, Breakwell treated many victims of poaching and the wildlife trade. 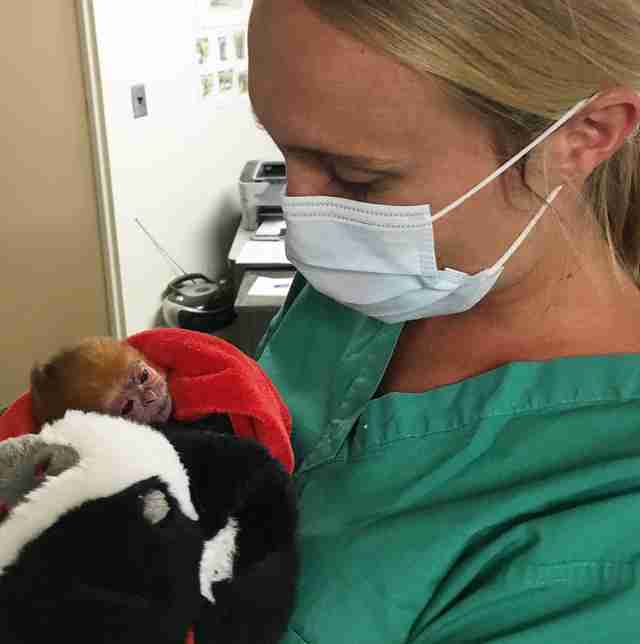 But she also shared some tender moments with injured and sick newborn animals who will eventually get to rejoin their moms in the wild once they heal. Overall, Breakwell finds solace in the happy endings. "It can be very emotionally challenging to constantly work with so many cases of animal abuse, so a happy story like Simba's is really uplifting and refreshing," she said. "Especially when so many people have contributed to giving him a better life." "I think almost every vet will agree that the rewards of the job far outweigh any challenges," Breakwell said. "I am loving every minute of it and feel very lucky to be in a profession as diverse and opportunity-filled as mine." Follow Chloe Breakwell on Instagram.